“Acid toner” is the label given to a toning lotion (or toner) that contains acids in the form of AHA (Alpha Hydroxy Acid) and/or BHA (Beta Hydroxy Acid), which perform an exfoliating function. Most often, these lotions will contain a form of glycolic, lactic and/or salicylic acid. These days, you may see something referenced as PHA (Poly Hydroxy Acid) included in the mix. The concentration of acids in these acid toners are usually lower than that found in a serum or a peel solution, as they are suggested to be used daily, or at least, often. Usually, they are recommended to be used after cleansing. These acid toners are what has brought back toners into most skincare routines. Acid toners also come in a low pH level (acid – duh! ), and quite often, they may sting your skin a little depending on the concentration of the acid used. This is especially so with glycolic acid products. Lactic acid is generally more “gentle”. Why do you need an Acid Toner? To say you “need” it is a little misleading. Up to 2 years ago, I’d have said that you NEED an acid toner in your skincare routine. NEED! Today, I’m revising that opinion. I’d say that having an acid toner in your skincare routine can be beneficial, with a few provisos. If your skin is very dull, congested, acne-prone and/or combination/oily, you may benefit most from regular use of an acid toner. I can tell you from experience that it is incredibly helpful when you have congested skin. I used to go through phases of congested pores, blackheads, and the occasional spot especially around the time of my period. Using an acid toner regularly kept these spots at bay, and kept my skin clearer, and brighter, smoother and better. Some acid toners have both AHA and BHA, some contain PHA as well, to refine skin texture and bind with moisture. Products that contain PHA are usually less drying and better for those with dry or dehydrated skin types. I used to think that I needed an acid toner with as high a percentage of acids in it, that I could tolerate. I was actually wrong. If you are going to be using an acid toner regularly (once a day for example) then you want something a little more gentle to avoid the risk of over-exfoliation. Over-exfoliation is a problem that I ran into now and again in the past 3 years, without really understanding why it was happening. Generally for me, when my skin is over-exfoliated, it takes on a sandpaper feel, looks dull and feels very dry, bumpy and dehydrated. My skin feels taut and uncomfortable. The odd time that it happened, I’d stop everything I’m using, and embark on my routine to recover from over-exfoliation. My experience with over-exfoliation is, by most accounts, mild. I have come across people who have experienced more breakouts and even cracked and peeling skin. This is attributed to the damage to the skin’s moisture barrier – the barrier that your skin has to hold in and retain moisture in your skin. When this barrier is damaged (often due to over-exfoliation) then your skin loses its ability to retain moisture, allows it evaporate and cause your skin to dry out. When you choose to use an acid toner, you should be aware of the other products that you are using alongside. Exfoliating skin is good. Over-exfoliating is bad. Acid toners work by exfoliating and removing the top layer of your skin. This is what makes your skin look more radiant. But it also means that you are exposing more new skin to the sun and UV rays. Sure, you can argue till the cows come home about there being no sunlight where you live at certain times of the year. But if you’re using acid toners, there really is no compromise on this. 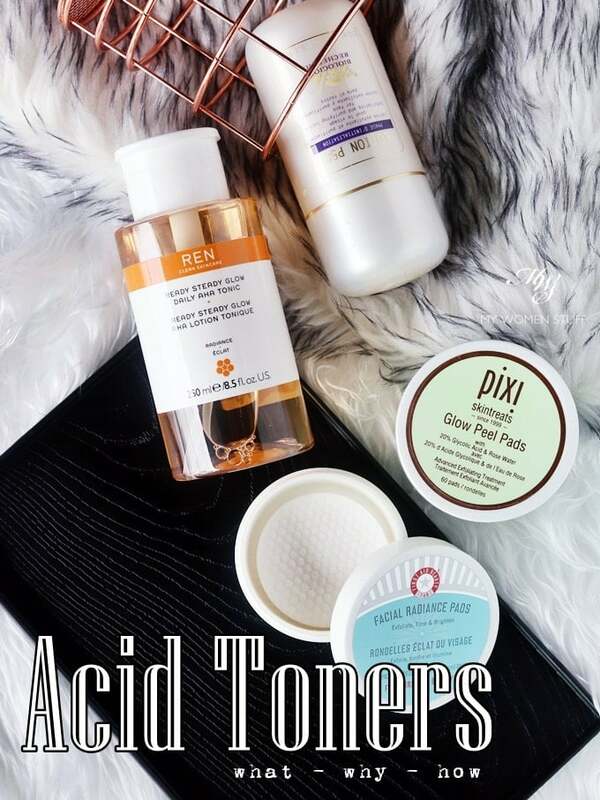 What acid toners do I recommend? Biologique Recherche Lotion P50 (review) – this is hailed as the gold standard of acid toners, and I fully agree. I have finished one bottle, and I am presently using one, with one more as a back up. I really don’t need to try any other, because this is the best. Non-drying (It contains PHA), fairly gentle and makes my skin feel and look clearer with regular use. Pixi Beauty Glow Tonic (Review) – Hailed as a “dupe” for Lotion P50. I disagree, as it really stands on its own. I like that it feels fairly gentle, isn’t drying and works well for my skin. For those on a budget, I’d recommend this one. REN Ready Steady Glow Daily AHA Tonic (Review) – This one contains willow bark and I find it a little drying for me. Otherwise, this is a good option too. 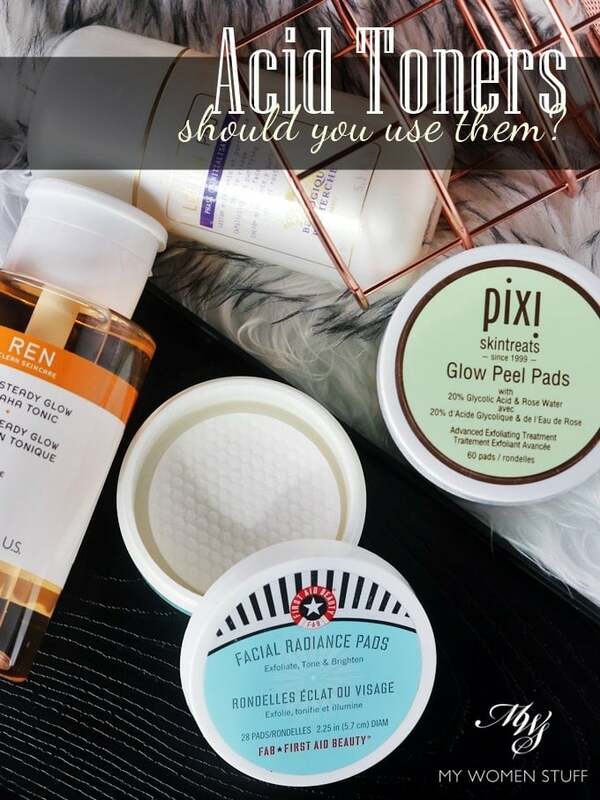 First Aid Beauty Radiance Pads – Very convenient, but I feel them to be a little more harsh than a cotton pad, and potentially dries up more quickly than you can use them. But they are portable. Hada Labo Mild Peeling Lotion with AHA and BHA (Review) – This one is affordable and effective. But do exercise caution as I have detailed in this post. What about Alpha-H Liquid Gold you ask? It’s got glycolic acid too. Yes, but it isn’t an acid toner. It is a treatment product that you apply and skip everything else. So no, it does not come in this category. What benefits do you get from an acid toner? An acid toner exfoliates your skin chemically (using acids) and this helps with reducing fine lines and wrinkles, pigmentation (so some say), makes pores appear smaller, smoothen the skin, decongests pores and makes skin look brighter and more radiant. Exfoliation is a good thing! Why have I stopped using acid toners? Ok, so that was a bit of a clickbait LOL! 😛 I haven’t really stopped using acid toners. I’ve just dialed back a lot on their use. I used to use acid toners daily. Sometimes, even twice a day, much to the consternation of some people who I’ve spoken to. This was great then. Skin looked brighter and more radiant, my spots went away, my skin decongested, it was great. Then, without realising it, I overdid things. I incorporated serums with acids in them. I liked Sunday Riley Good Genes and REN Wake Wonderful serum, both containing lactic acid, and I was using them often. Usually, alongside my acid toners. I also double cleanse in the evening with a cleansing balm first, and then a cream/milk cleanser. Often, when using a cleansing balm, I’d use a face cloth. That was really too many exfoliating steps right there. As I was saying above, I noticed that I was experiencing the side effects of over-exfoliation a little more often than I felt comfortable with. So I did something drastic. I stopped using acid toners for about 2-3 months to observe how my skin reacted. In that time, I kept to my regular routine, and upped my moisture and hydration, alongside other actives. Does it mean I can exclude acid toners from my skincare routine? Well, not really. They are still very useful products, as I’ve detailed above. When I notice a bit of congestion, a wipe of acid toner usually clears it up quickly. If my skin feels like it needs a truly deep cleanse, one swipe of an acid toner after cleansing, and it feels ready to soak up the rest of my skincare routine. However, when I travel I always carry an acid toner with me and use it – the First Aid Beauty Radiance Pads and the Pixi Glow Tonic pads are useful for this purpose. The reason is because I am outside more often than in my regular daily life, and exposed to more environmental stresses and pollution. A wipe of acid toner over my skin after cleansing helps keep my skin more clarified in an unfamiliar environment, where I may not be cleansing my skin as well as I should be. This also keeps holiday breakouts at bay. I used to breakout when I go on holiday, but keeping an acid toner in my holiday skincare routine has reduced the odds of it happening. The thing is this – there is a lot of information out there, and many of us struggle with information overload. Today, there is a trend to use a particular product or ingredient. Tomorrow, there is a new gadget or product that does something else. We must be able to think for ourselves, how that product/ingredient fits in our skincare routine, and if we are focusing too much on one aspect, to our detriment. It took me a few cycles of healing my skin after over-exfoliation to realise that it was a problem, and it took me a while to realise what it was. You can read a little more from Renee Rouleau about her take on acid toners and why they may not be the best option. I agree with her on many points, but I also disagree on some. I must say that I have experienced the benefits of using an acid toner when my skin needed it most, so I’d say work with your skin needs, not what everyone else is doing. Skincare is absolutely fascinating. We just have to learn what works for us. Do you use an acid toner? Have you experienced over-exfoliation? Do share your thoughts on this. I am aware that many people are starting to use acid toners, but may not be aware of how they may cause more harm than good if we aren’t careful. Many people are also not aware that they are over-exfoliating their skin. I’d like to hear what you think. PREVIOUS POST: Tell you what? I think the Estee Lauder Advanced Night Repair Recovery Mask-in-Oil is better than the ANR serum! haha clickbait sucker i am! thanks for still blogging though, i find that everyone is now on youtube and hard to find good detailed reviews! keep it up Paris B! Oops! LOL 😀 Thank you for still reading Nurdina! People tell me Instagram & videos are the future, but hey, I guess there’ll always be a small space for those of us who still prefer skimming the written word 🙂 Thank you for the kind words of support! Thank you for sharing your observations even if it means going back on what you previously advocated. THIS demonstration of honesty and integrity is the main reason why I’ve been a constant reader over the years. I’ve long had my suspicions about the daily exfoliation hype and claims that acid toners are ëxtremely” gentle. That may be so but one still has to determine if it works on an individual basis. 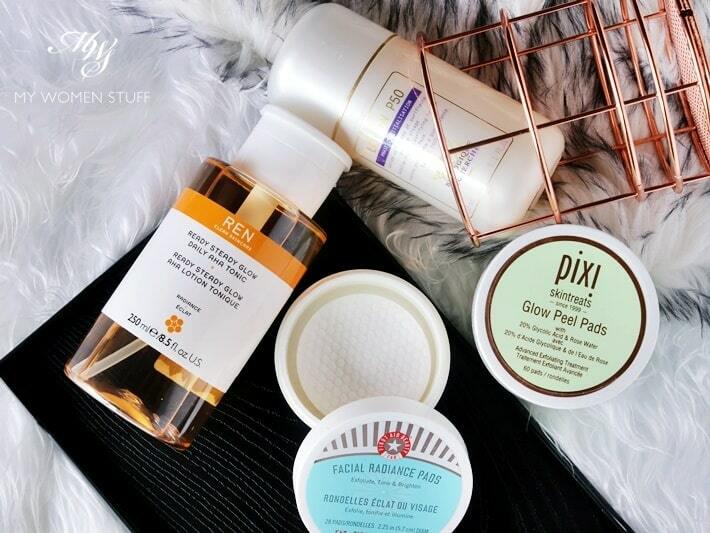 I generally use the Pixi Glow Tonic once every two days and even that borders on a possible overexfoliation as I sometimes feel that slight tightness on my skin. This post pretty much confirms my suspicions and I might cut down to just twice a week and see how it goes. I should point out that my skin is more sensitive than what I gather yours to be. I’ve been hesitant to add a vitamin C serum to my skincare repertoire as I understand those have exfoliating qualities as well. Do you take that into account as well when cutting back on the exfoliation process? Thank you Isabel 🙂 Yes I remember being that rah-rah cheerleader of acid toners haha! Oh well, we live and learn! To be fair, at the time, it was very effective for me especially when dealing with breakouts. I do think there are gentle formula out there, and some like Pixi and Lotion P50 are well formulated so they balance off some moisturising ingredients in there as well to protect the skin. Actually, that slight tightening of the skin is quite expected of products like this. I think it’s to do with how it works as it has a slight astringent effect as well. Still, work within what your skin tolerates. I do find the odd wipe of an acid toner refreshing, and almost seems to prep my skin to absorb everything I throw at it. But am more careful now. I always thought these acids toners are not a must for everyday routine having experience tighten skin after using them. Except for wonderful salicylic acid. There are options to even milder approach to exfoliation, the underrated enzyme wash and peeling gel, are my favourite. What’s your take on the Pixi Glow Peel Pads? I find the 20% glycolic acid is too concentrated. Hi Margaret, the 20% peel pads are a treatment that needs to be washed off. So you don’t actually leave it on your skin overnight. They have another version that contains 5% glycolic and is essentially Glow Tonic in a convenient ready to use pad format. Those you can use regularly. Thank you for the info. I still have the Pixi Glow Tonic that you have given. It does last quite long because I only use it once or twice a week whenever I see white/blackheads. The pricky sensation gone as I develop immunity to low conc. acids now. Doesn’t Salicylic acid work the same way too Margaret? I’m no expert of course, so I don’t know. I do know however that I find it very drying for my skin so I try to avoid products that contain salicylic acid or similar. That said, when I was having problem with spots, salicylic acid is a lifesaver! I’ve always found peeling gels really weird – the residue reminds me too much of the residue from erasers in school! LOL! Could never be sure if it was just the gel balling up, or if it was really doing anything – do you have a favourite peeling get or enzyme wash? As for the Peel Pads, as Lezel has shared, it isn’t exactly like the Glow Tonic, but more of a “treatment” type product. There is one that is the travel version of the Glow Tonic though. I have blackheads due to oily T-zone so salicylic acid is wonderful. Yes, peeling gel does balls up during rubbing so hence the exfoliating effect. Have you heard of Kanebo Suisai Enzyme Face Wash? It’s water activated powder face wash but unfortunately it foams as well so can be drying. Only twice a week treatment, I’m suppose, just like acids. I’m intrigued by the Japanese way of cleaning with beaten up dense foam without touching the face. I use acid toners — mostly the occasional vitamin c serum and then also Amlactin, which is what dermatologists recommend for rough skin conditions like keratosis pilaris, so it may not be ideal for people with sensitive skin. But I only use it once a week. Acid lotions/toners should be used sparingly! Absolutely Christine! I rather despair that people are pushing for it to be used as part of a routine, and in many instances, using quite strong formula. I used to as well, but I’m glad I wised up! I have been using acid toners since I discovered both yours and Caroline Hirons blogs. I did stopped using it for a period of time and I noticed that my skin became dull and I started having more breakouts which I did not usually have. I had incorporate Pixi Glow into my routine and I used to used it daily or every alternate day but somehow, I still had breakouts. It was only when I started using Cosrx Blackhead Power Liquid which contains salicylic acid and willow bark (not your favourite ingredient unfortunately) that I noticed that my skin was more calmer, clearer and rarely having breakouts. But I agree on your point that overusing acid toners can actually have a detrimental effect to your skin. So these days, I used the Cosrx acid toner every alternate days because I do not acid tone on days that I use Retinol or Alpha-H Liquid Gold. You mentioned a good point though about over-exfoliation if you are using the wash cloth method, acid toner and serums with acid on the same night. But I do not use serums with acid so hopefully, using the face cloth cleansing method and acid toning in the same evening would not over-exfoliate my skin. LOL. Haha yeah I picked it up from CH too! I have nothing against them, and in fact, I do encourage having at least one in the routine because as you’ve said, it can help skin look brighter and help deal with breakouts too. I stopped using it at about the same time that I noticed that I don’t get breakouts as much anymore, unless I do something silly with my skincare. Also, I find that building good moisture really does help with the dull skin factor too – skin does look less dull. Salicylic Acid is very good for breakouts so it’s good you discovered it. Really helps keep them at bay and clear them up! These days, if I spot some clogged pores or little bumps, a day or two of acid toner usually helps them go away. I use something a little different but probably serve the same function – MUAC Gly-Luronic serum which contains glycolic acid. I would only use it when I spot pimples because the serum helps put pimples under control (it kills them within 2 days). Frequency of application tends to be months apart though. Yes, it is very important not to apply harsh ingredients at the same time. For instance, it’s a no no to apply multiple exfoliations to the skin at the same time, be it in the form of facial scrub, clarisonic (as you’ve mentioned), microdermabrasion, vitamin C serum (high strength), retinol etc. It’s good you write a post to remind people about the danger of over-exfoliation. My god I wasted so much money on that stupid Clarisonic! What a load of rubbish it was for me. That said, there are people who do find it helps them, although I honestly cannot say how it is any more beneficial than using some good products that won’t take off the top layer of your skin every time 😛 But yes I do think people tend to not think about the fact they may be over-exfoliating their skin. I think it’ll be a problem that we’ll see happening more often in the coming years as more people dive into using products with acids without really thinking about it. Hopefully they wise up and pay a little more attention to their skin! Hmm…coincidentally Im going through the same phase as well. I used to think I need them. I bought P50 through the contact number that you put on previous article, lactic acid 10% by The Ordinary, Cosrx AHA and BHA, Liquid Gold from that website that was bought over by Sephora (i think). Bought them all, tried them all. Funny thing is, I’ve been using Indeed Labs retinol at night with moisturizer only and my skin is at its best. Pimples seems pretty shy of hanging around my face these days and I’ve been wearing less and less foundation (shocking because I never went out without a medium coverage at least). I bought Differin and try it out for a week plus by replacing it with my usual Indeed Labs retinol and it works just as good. Once im done with Indeed, Im sticking to Differin because they are way cheaper and easily availabe at Caring. I dont missed them at all. Great reminder to just listen to your skin and just give it what it needs! I am curious on your thoughts/experience on using vitamin c with exfoliating acids. Is it too much for you? Hi Bev, glad you found it helpful 🙂 As for your question, I shared some thoughts on this same Vitamin C question in answer to Isabel above haha! but in gist, I don’t have any trouble using Vitamin C serums with acid toners, primarily because I use them at separate times. I use Vit C in the morning and acid toners in the evening. I have used Vit C in the evening as well, after acid toner and a spritz of mist. This is primarily as there isn’t a lot of research to show that Vit C is exfoliating despite its acidic nature. If anything, the acidic nature may irritate sensitive skin, and that primarily only in products with L-Ascorbic Acid. Other Vit C derivatives are usually much less irritating. So to answer you, nope, no problems at all for me! I’ve read your blog for years and I actually never thought of you as an acid advocate, so this post came as an bit of a surprise to me. Reading this, from my perspective you use a lot of acid! Unless we count vitamin C, I never use acid on my face. I use some on my body to deal with hormonal acne. Mandelic acid to be specific. You didn’t mention it under the AHAs, which I think is a shame. It’s light sensitive and should be in an opaque container to not break down, but if you have dry and/or sensitive skin it’s fantastic. The bigger molecule size means it isn’t as irritating as glycolic or lactic acid and exfoliate more lightly. There is apparently also some research that indicates that it maybe helps skin produce more sebum, which if you have dry skin is a good thing. I use it once a week. I just bought some salicylic acid to try out out get at that last little bit which wouldn’t budge with the mandelic acid. I do like what it has done, but I will be very careful using it, and will be on a lookout for a gentler BHA (at there any? ), because I absolutely hate the unnatural smoothness, tightness, and shininess it imparts if you don’t use it very, very, very carefully. Yes, so many people overdo actives, including some reputable beauty bloggers. I examine my skin twice a day and adjust my skincare accordingly.